Not From Concentrate means that the juice is squeezed from the pulp of the fruit. A NFC juice is more natural as no sugar or water is added. Our NFC pineapple juice is not only 100% juice and natural, but it is made from 100% golden pineapple. This means that there is a natural extra sweetness, aroma, and color making our juice a true experience. The healthy benefits of drinking 100% juice and nothing else, besides the fact that MD2 pineapple is a wonderfully delicious fruit and excellent addition to your palate, it is also a rich source of the enzyme bromeliad. The juice and the extract of the fruit are used in many dishes. Bromelain and vitamin C are what makes pineapple one of the healthiest foods. The nutrients of pineapple are great for healing the body and also excellent for maintaining overall health. Is Pineapple Jui ce Good For You? Fresh juice of pineapple is extremely nutritious and contains a lot of vitamins and minerals. Vitamin B6, thiamine, manganese, magnesium and potassium are all nutrients that the fresh fruit contains and can help improve overall health. Why should I prefer not from concentrate pineapple juice? Not from Concentrate is 100% natural pineapple juice. It is a delicious drink, that is also good for your health. Natural pineapple juice is very nutritious, it provides several vitamins and minerals, like vitamin C, vitamin B6, thiamine, folic acid, manganese, magnesium, calcium, phosphorous and potassium. This juice is totally natural, has no added sugar or artificial sweeteners or additives. What are the nutritional benefits of pineapple juice? Vitamin C is a recognized anti oxidant that helps fight against free radicals, for the body to be able to maintain its cellular balance. Vitamin C also helps strengthen the immune system. Vitamin C also helps in iron absorption when eaten simultaneously. Bromelina is a substance present in the natural pineapple juice that helps digest amino acids from proteins. People say that pineapple juice is a natural diuretic, is this true? Pineapple juice is a good natural diuretic because it helps the body eliminate water in a natural way. This helps prevent bloating, which is a plus, when you are trying to loose weight. If I drink natural pineapple juice, will it make me feel happier? Yes, it will! This is because the natural pineapple juice stimulates serotonin production in the brain, and serotonin is thought to be a contributor to feelings of wellbeing and happiness. What´s the difference between Juice NFC and one juice made from concentrate? The difference is that a juice NFC is a totally natural juice. Juices made from concentrate go through several processes, which may even include adding preservatives, artificial flavors and colors and in some cases even sugar. Natural juice NFC is the closest you´ll get to having fruit at it´s natural state. 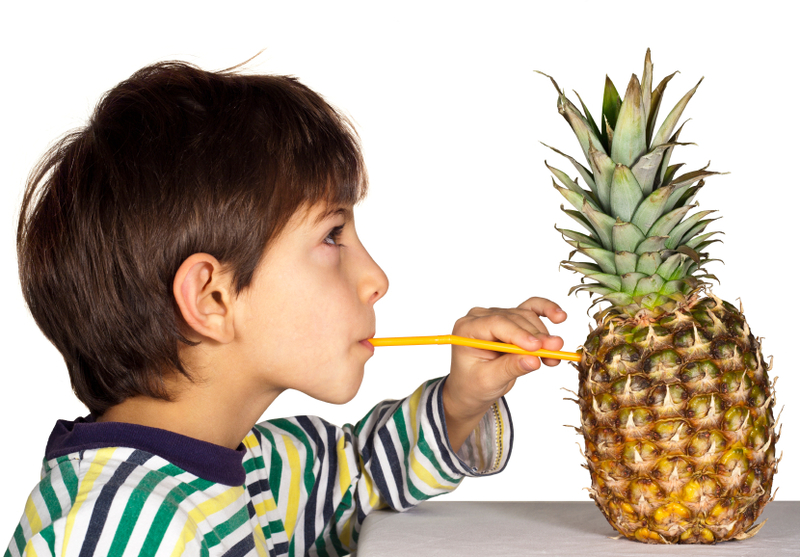 Will kids benefit from drinking natural pineapple juice? Kids will benefit from drinking this juice because of its great amount of vitamins and minerals, especially Vitamin C which help prevent kids from getting sick. How many calories does a glass of pineapple juice have? 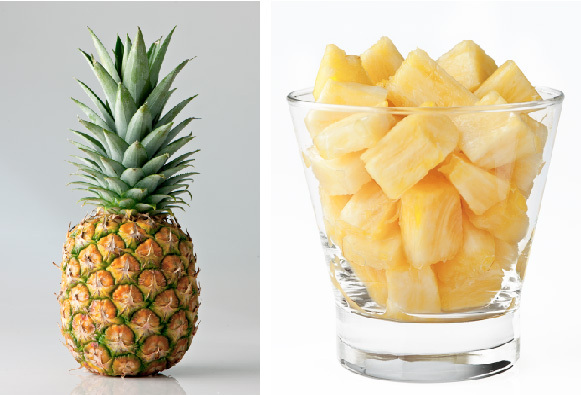 A 250ml glass of natural pineapple juice has around 105 calories. Can you prepare recipes with this juice? Yes, you can! Natural pineapple juice can be used as an ingredient for preparing refreshing drinks. You can do this by adding fruits, like strawberries, papaya, celery and bananas. You can also create several desserts and even use natural pineapple juice as an ingredient for entrées like sweet and sour pork chops. Is it ok to combine this juice with food or is it better to drink it alone? You can drink natural pineapple juice at any time during the day, with o without food. Let´s remember that the vitamin C present in the juice helps iron absorption in the digestive system, so it´s ideal to combine certain food sources of iron with pineapple juice for a better absorption of this mineral. Is it good for your digestive system? Natural pineapple juice helps during digestion because it contains a substance called Bromelina, that help digest proteins. The pineapple used for preparing our juice is a result from a new variety of pineapple that was meant to be sweeter than other varieties. This variety is known as Golden Pineapple, MD2 or extra sweet pineapple and it has been known for its development in Costa Rica. Why is our juice different from other juices? Our natural pineapple juice has a delicious flavor and a very low amount of calories per serving, since it´s a result of the extraction of the pulp of the pineapple known as Extra Sweet Pineapple. Our juice has an outstanding sweet flavor, intense yellow color and nice aroma, totally different from other juices from South America or Asia. Nevertheless, natural pineapple juice is an excellent source of a great variety of vitamins and minerals, needed in order to maintain a good overall health.